This easy sloppy joe recipe from scratch is awesome. Tangy and so delicious, it won't last long on the table. When the kids are anxious to eat, this is something that you can put together in no time. Serve with roasted potatoes and dip in homemade ranch dressing. I also give you my easy homemade bun recipe that is an blue ribbon winner, and also many old fashioned hamburger recipe meals for you to try. In a heavy skillet over medium-high, brown the hamburger and onions; drain well. Add the remaining ingredients and simmer for at least 30 minutes. Fry the ground beef in a skillet over medium-high until no longer pink. Drain well and add the remaining ingredients. Bring to a boil and simmer for at least 30 minutes. 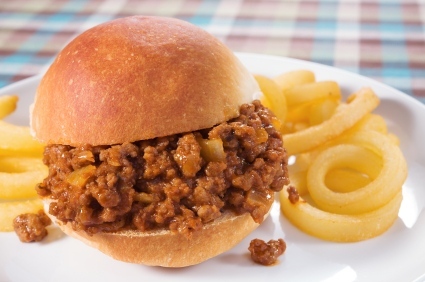 This recipe makes 2 dozen buns and is perfect for my easy sloppy joe recipe. You can make a large batch by doubling the recipe and make bread sticks, brat buns, hoagie buns or even cinnamon rolls. Place into the freezer until you need them. Place the yeast, and white sugar in the 1/2 cup warm water and set aside. Add the salt, sugar and vinegar to the yeast mixture, and mix for 30 seconds. Now add the oil and mix another 30 seconds. Add 1/2 of the sifted flour and mix to form a soft dough. Then added the remaining flour, one cup at a time, until the dough was stiff. Spray your mixing bowl with vegetable oil and add the dough. Turn the dough to cover completely with oil and cover with plastic wrap. Cover and let rise for 45 minutes or until doubled in size. Roll out dough to 3/4" thick and cut (use biscuit cutter or a glass) into 3-inch rounds and place on a baking sheet. Preheat oven to 375 degrees. Let the buns rise again for another 20 minutes and then bake for 15-17 minutes.